The Soup Course at the She-She Café depicts a restaurant-like setting: a man and his wife sit at one table, while a young woman occupies another; both tables have been served soup. Stale Americana pervades the conservative, petit bourgeois décor, with its folksy furniture, ornamental silverware, and a small framed painting of a rural building. Upon closer investigation, the conventionality of the scene dissolves: Next to the man’s right foot a phallus protrudes as he gazes at the young woman in a scarlet dress at the neighboring table; his wife’s face is covered with a napkin. The photograph that is placed as a face on the sculpture of the young woman is a portrait of the Kienholzes’ daughter. The work suggests that patriarchal aggression and sexuality are at the center of conventional American narratives. 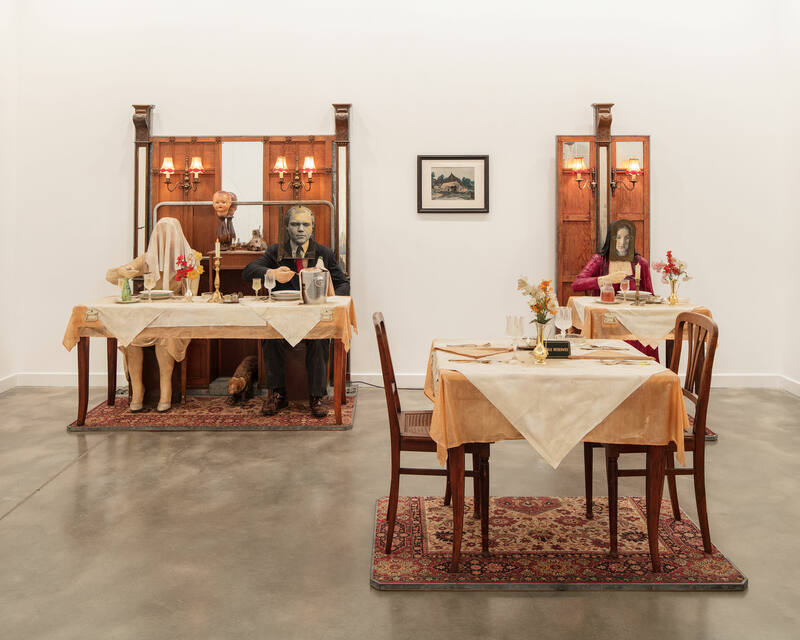 The Kienholz’s elaborate found-object tableaus and assemblages famously scrutinize American society, addressing issues of war (Portable War Memorial, 1971), racism (Five Car Stud, 1969–72) and working class culture (The Beanery, 1965). During the early 1980s, Nancy Reddin Kienholz (b. 1943) and Edward Kienholz (1927–1994) collaboratively produced a series of tableaus focusing on the representation of women. Featuring female subjects performing functions that define them in relation to men—as wife, lover, widow, mother, or daughter—these works raise questions about female agency in American culture. Soup Course at She-She Café is part of “The Berlin Women” series, which the artists produced after moving to Germany in 1973, utilizing found objects from Berlin flea markets in many of the works. The Kienholzes began collaborating when they met in 1972. However, it wasn’t until 1981, for the opening of The Kienholz Women exhibition at Galerie Maeght in Zurich, that they announced their collaboration. Subsequently, Edward declared all of the works since 1972 as coauthored by Nancy Reddin Kienholz. Even though Reddin Kienholz and Kienholz never made a clear statement about respective input into the collaborative works, the most marked change since Nancy’s involvement was the frequent use of photography. An autodidact and artist from Washington State, Ed Kienholz founded Ferus Gallery with curator Walter Hopps in Los Angeles in 1957, which soon became a West Coast hub for the international avant-garde. Nancy Reddin Kienholz grew up in Los Angeles and is a self-taught artist and photographer. The artists have had solo exhibitions at the Kunsthalle Düsseldorf; Akademie der Künste, Berlin; the Walker Art Center, Minneapolis; the Menil Collection, Houston; the Whitney Museum of American Art, New York; and the Fondazione Prada, Milan. Their work is held in museum collections all over the world including the Stedelijk Museum, Amsterdam; Museum of Modern Art, New York; Whitney Museum of American Art, New York; Museum Ludwig, Cologne; Los Angeles County Museum of Art; Tate Modern, London; Moderna Museet, Stockholm; and the Walker Art Center, Minneapolis. Nancy and Edward produced art together until Edward’s death in 1994. Nancy lives in Hope, Idaho; Houston, Texas; and Berlin, Germany.